Do you ever get overwhelmed by the long list of ideas or creations that you have to make or better yet, those things you want to make? I do. But here’s been my problem lately: I haven’t had as much studio time as I usually do and won’t this entire month due to scheduling conflicts. This means that I’m behind in both creating and getting things listed in my Etsy store. 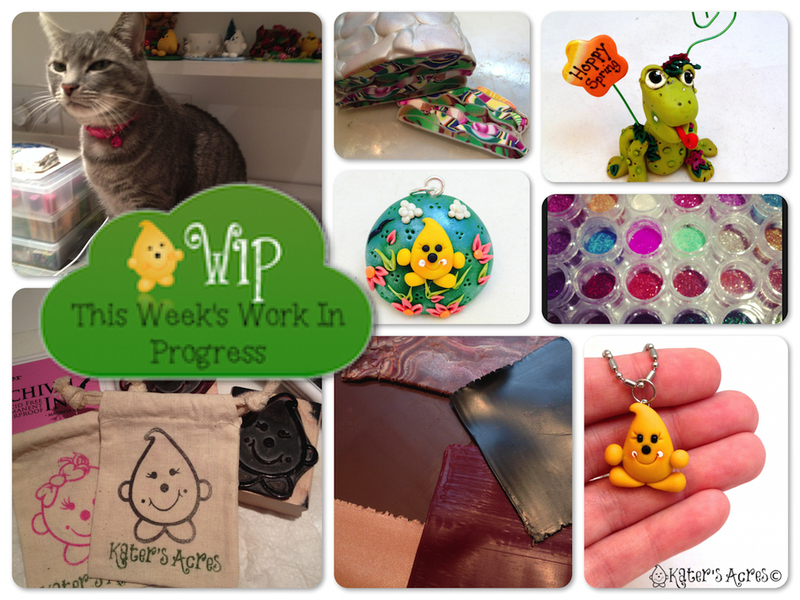 I really have enjoyed doing these WIP Wednesday posts however, because they are showing me how much are actually get done. I snap photos of everything in my studio now: in process, when it’s finished, ideas, colors, patterns, you name it! But it allows me to be more creative than I have been in a long time. The end of the month is always a tiny bit stressful for me, because I look at the list of things that I had to do and see how much didn’t get done, while still celebrating the things that did get done. All of those things being said, I did get some work done in my studio this week. Most of that work was “maintenance work” but things that needed done anyway. So … let’s see what all I did …. That little stinker in the photograph is my kitty cat, Smokie. She often comes down to help me in the studio … but often she’s more of a hindrance than I want her to be. In this picture she had just gotten done attacking a plastic bag … an empty plastic bag. Lookie there … another finished Stroppel Cane! This one I did in pearl and I think it turned out beautifully. This little frog photo holder is the newest free tutorial to hit the blog. Make sure you read the “NOTES” for more ideas on how to make this design your own. Glitter … I spent 4 hours this week sorting & packaging all the glitter I had lying around. And here’s the kicker, there was enough to fill 60 of those tiny little jars. OY! Parker jewelry has finally arrived in my Etsy shop. I have received many requests for jewelry for Parker. So for those of you who have requested it, you can adopt your own Parker jewelry here. The picture of the clay sheets is for an upcoming tutorial. Leave your guesses in the comments below as to what you think it might be. I spent about 8 hours this week also making more bags for my designs as I was almost completely out! Those little muslin bags accompany every Parker or Lolly that is adopted from my store. Just another way that I like you to smile when you open your packages from me. I’m on a swift two week countdown until my weekend long workshop with Christi Friesen. It’s not hard to imagine, I’m über excited. Of course, it’s Christi … who wouldn’t get excited at this. For the first time in over a month, I put all the canes away that I had sitting around from the 52 Weeks of Canes and the “cane kick” I’ve been experiencing … I filled an entire floss box with them. YOWSERS that’s a lot of canes! I received my Cane Builder eZine from Meg Newberg this past week. She has yet again another great monthly caning project. See my review of this eZine here. Sign up for the eZine here. I Want To Hear From YOU! What are you working on?